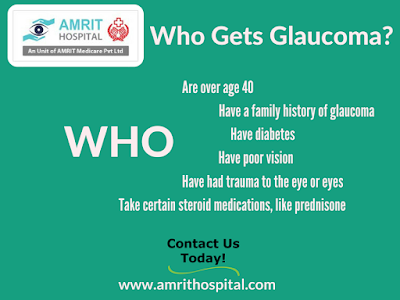 Glaucoma is a condition which causes damage to the eye’s optic nerve and gets worse with time. It's often linked to a build up of pressure inside the eye. It is the result of high fluid pressure inside the eye. This happens when the liquid in the front part of the eye doesn't circulate the way it should. Normally, a fluid called aqueous humor, flows out of the eye through a mesh-like channel. If this channel gets blocked, the liquid builds up. That’s what causes glaucoma. Less common causes include a blunt or chemical injury in the eye, severe eye infection, blocked and constricted blood vessels inside the eye and various inflammatory conditions. It mostly affects both the eyes, but it may be worse in one than the other. Eye drops- These either reduce the formation of fluid in the eye or increase its outflow. Side effects may include allergies, redness, stinging, blurred vision, and irritated eyes. Some glaucoma drugs may affect your heart and lungs. Laser surgery- This procedure can slightly increase the flow of the fluid from the eye for people with open-angle glaucoma. It can stop fluid blockage if you have angle-closure glaucoma. Microsurgery- In a procedure called a trabeculectomy, the doctor creates a new channel to drain the fluid and ease eye pressure. Amrit Hospital, Chennai is the leading eye care center in India. They provide the best treatment using the latest equipment’s at affordable rates. The success of an eyelid surgery highly depends upon the expertise of the surgeon. You must research well for a reliable cosmetic clinic with a highly qualified and experienced surgeon of eyelid surgery in Dubai and Abu Dhabi. Great Article!!! Thanks for sharing for your experience with us..!! People from India bow make their appointment with the Rana Hospital if they want the lasik eye surgery in India with fast and successful results. We are the number one hospital in India that give you perfect results using the modern laser methods. Nice blog and beneficial content.Get Glaucoma surgery in India. at low cost only with Guru nanak Vision care centre. Check our website for more details.